Why Is Daily Exercise Crucial For Your Dog’s Good Health? Health is of prime importance for every living being on the Earth, whether the animals are aware of it or not. Yes, humans are conscious about their health and about what would they need to keep themselves fit and healthy. On the contrary, animals like canines and felines are not conscious about it and their behavior solely depends on their likeness. So, the responsibility of maintaining our furry friend’s health is upon us, the guardians of dogs. Just as humans need to exercise to keep themselves fit, dogs too need the same. In fact it is more crucial for dogs to exercise daily as it stimulates both, mental and physical health of a pooch. Along with the stimulation of the body, exercises like walking or playing with your dog has many benefits and is equally important. Let’s see why daily exercise is important for canines! Don’t miss the run- Why is it crucial for your pup? Maintaining a perfect and a healthy weight is very important. With the flooding market of commercial foods for pets, raw and healthy food has almost become impossible to feed to pooches which ultimately results in adding fat to your dog’s bellies. 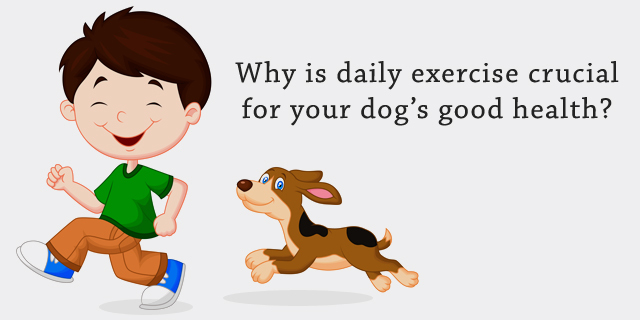 Regular exercising helps in maintaining your pooch’s weight and health. Obese dogs are prone to heart problems, and other issues like diabetes. If your canine is obese, then plan work out sessions for him and overcome the issue of obesity and unhealthiness. Start with gentle walk for 15 minutes twice a day and increase the time and intensity gradually. Canines may have behavioral issues if they do not receive physical stimulation that they need. They may turn aggressive, or may exhibit behaviors like digging, barking, chewing, and excitability. Exercising help them stimulate physically and mentally which sheds their energy and keeps aggression at bar. Working out keep the canines active, fit, and quick. It increases the muscle and joint strength in dogs. It also helps in increasing flexibility with time. Exercise may tire your furry friends and this let them have a great sleep. Scanty workouts keep their energy stored and this may affect their sleeping habits. To give your pets a satisfactory sleep, make sure you give them the physical strain that they need. DO you know when this could be great? When you need to leave your pooch alone at home! Exercise your dog before you leave to find him asleep when you are back. Canines have a habit of eating often. For some it may work, but for others there may be digestion issues the every other day. To cope with the digestive problems of your pooch make it a point to get him appropriate amount of exercise. Walking, swimming, playing Frisbee or fetch are some of the most beneficial exercises that help the digestive system to function properly. Last, but not at all the least, it is super fun! Running on a beach with your pup, playing fetch or Frisbee or simply exploring the woods could be fun with your pooch. This may become your personal time to bond with each other. So, are you ready to make your dog fit and healthy? Try not to miss on your pooch’s workout schedule to keep him healthy and fit. PREVIOUS POST Previous post: Cyber Monday Discounts- Buy More To Save More at Canada Vet Express!